After a drawing of a Dodgers legend was stolen, the owner of a popular Mexican restaurant in Echo Park -- who also created the artwork -- is asking public to help identify the thief, captured on surveillance camera. "That piece to me was something I specifically did for this restaurant, " said Armando Delatorre Jr., who runs the restaurant with his father. "I've always had a love for the Dodgers. I was born and rasied a Dodgers fan." Armando Delatorre, co-owner of Guisados, posted pictures to Facebook and Twitter, asking customers to help find a man (pictured below) and two others seen carrying the portrait out of the store. An apparent customer stole a painting of an LA baseball lenged from Guisados restaurant in Echo Park. 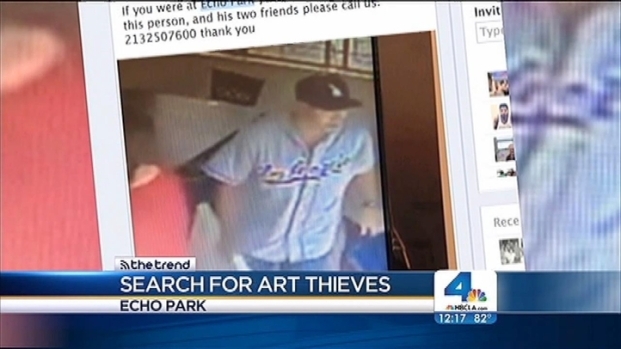 The owner, who created the artwork, is using social media to find the thief, who was spotted by a surveillance camera. Mekahlo Media reports from Echo Park for the NBC4 News at Noon on Aug. 13, 2013. The painting, which has been hanging in the store's dining room since it opened in January, is invaluable, Delatorre said. The theft occurred about 4 p.m. Aug. 10. Three men in their early 20s wearing all Dodgers gear ordered and ate at the restaurant. 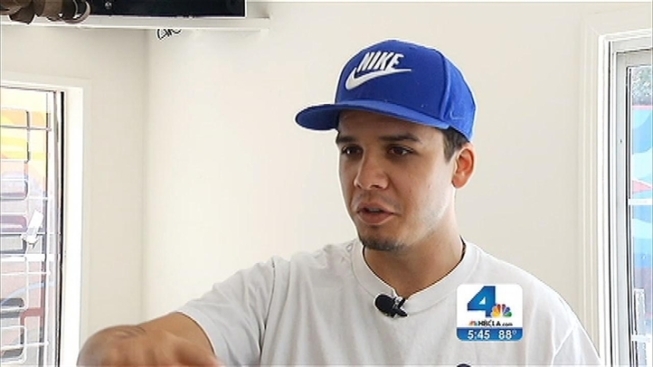 They took the drawing with them when they left, Delatorre said. The men are accused of stealing an original black-and-white drawing (pictured below) of legendary Dodgers pitcher, Orel Hershiser, a three-time All-Star who won the Gold Glove, Cy Young and World Series MVP awards in 1988. The owners said no questions would be asked if the drawing is returned.